This morning, I combined the tulips that I bought last week at the supermarket with some white sweet woodruff, or Galium oderatum, just picked from a shady spot in our backyard. 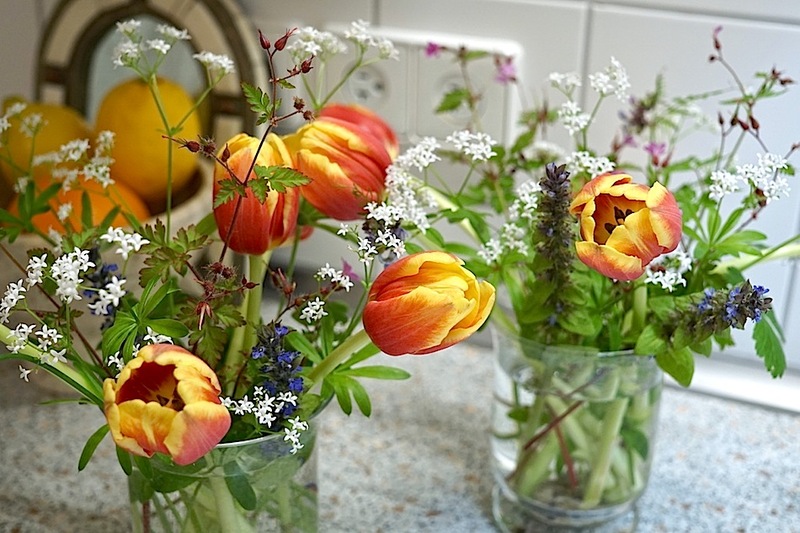 The flowers in my arrangements smell lightly of honey, but sources say that as the plant wilts and dries, its leaves will smell like fresh-cut hay and vanilla. G. oderatum is native to Europe. In Germany, it is known as Waldmeister or ‘master of the forest.’ Traditionally in spring, before it blooms, its leaves have been added to wine to create May wine or Mai Bowle. For a good discussion of the culinary uses of the herb in Germany — where it flavors jell-O and hard candy — see this article, “May’s sweetest herb,” in the blog Spoonfuls of Germany. To see what other gardeners have put in a vase today, please visit Cathy at Rambling in the Garden. Hi Cindy, sweet woodruff looks nice with the tulips. It does. I was going to make an arrangement of just wildflowers, but the tulips really make it work. Very pretty, Cindy! There’s a touch of blue in there too, isn’t there? Is that Ajuga? It’s a wildflower/weed from the lawn — as are the little pink flowers. I need to look them up. When I find the names, I will come back and put them in the post. They really work well together — a nice finale for this year’s tulips; I think these are the last I will buy until next spring. I have always wanted to make Mai Bowle or May wine too. Maybe next year — I think I need to use the leaves before the flowers open. I love sweet woodruff! So nice to see it in your vase and have some background on uses in Germany. I think it was also used as a ‘strewing herb’ (put on the floors of houses to give a pleasant smell, distracting from the noxious ones) in Tudor England. And so pretty with your tulips!